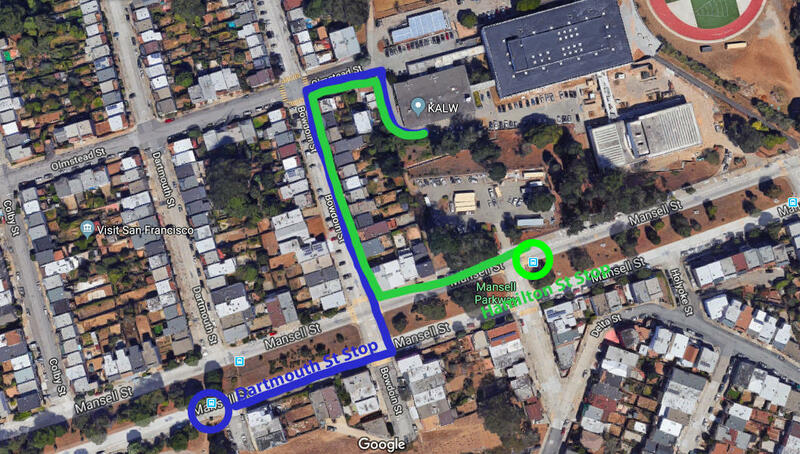 Please note: The KALW studios are not located directly at 500 Mansell Street, so using online map searches is not recommended. If you have any difficulty finding us, please call our studio line 415-841-4134. Take 101 South, exit at Paul Avenue. At the stop sign at the end of the ramp, cross San Bruno Ave. and continue straight up Mansell Street. Follow Mansell up the steep hill, go seven blocks, passing Philip and Sala Burton High School on your right, and take the next right at Bowdoin. Go downhill one block and make a right turn on Olmstead. Pass through the fencing and take an immediate right, then continue around the corner with the building on your left. KALW's main office entry is the first door on the left, marked with a small sign. The parking spots across from our front door are reserved for KALW guests. Take 101 North, take the Paul Avenue exit. At the first stop light, take a left onto Paul Ave. Continue under the overpass, then make a left onto San Bruno Ave. Go to the first stop sign and turn right onto Mansell St. Follow Mansell up the steep hill, go seven blocks, passing Philip and Sala Burton High School on your right, and take the next right at Bowdoin. Go downhill one block and make a right turn on Olmstead. Pass through the fencing and take an immediate right, then continue around the corner with the building on your left. KALW's main office entry is the first door on the left, marked with a small sign. The parking spots across from our front door are reserved for KALW guests. The Muni 29 bus line runs on Mansell Street. Transfers from other lines to the 29 are available at Balboa Park BART station (on the Ocean Avenue side); Mission and Persia streets; or San Bruno and Paul Avenues. The closest stops to KALW are Dartmouth Street and Hamilton Street. From the Hamilton Street stop: Continue walking up Mansell one block to the intersection of Bowdoin Street. Turn right on Bowdoin. Then take a right on Olmstead St. and enter campus. Take an immediate right, and follow the driveway in a left turn around the rear of the building. KALW is the first door on the left. From the Dartmouth Street stop: Continue straight down Mansell to the intersection of Bowdoin Street. Turn left onto Bowdoin. Then take a right on Olmstead St. and enter campus. Take an immediate right, and follow the driveway in a left turn around the rear of the building. KALW is the first door on the left. Get off at the Balboa Park Station where you can catch a Muni 29 Sunset bus (make sure to exit the station toward Ocean Avenue, as the 29 runs along Ocean).